In November it forecast sales of at least $89bn - a prediction that had already disappointed investors. Apple's share price sank more than 7% in after hours trade, extending its more than 28% slide since November. Apple's warning about a Chinese slowdown has reached certain luxury retailers with large Chinese customer bases. Burberry is down 6%, Mulberry 4% lower, and LVMH, Hermes and Richemont are 3% lower. The festive season is typically Apple's strongest quarter. But revenue of $84bn would mark an almost 5% fall from the same period last year and represent the firm's first year-on-year quarterly decline since 2016. 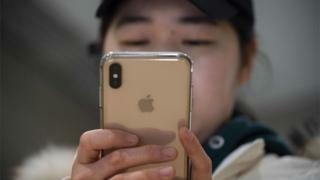 In a letter to investors on Wednesday, chief executive Tim Cook said the firm's sales problems were primarily in its Greater China region, which includes Hong Kong and Taiwan and accounts for almost 20% of its revenue. Is Apple making China a scapegoat? What's gone wrong at Apple? Are clouds gathering over the world economy? However, he added that developed markets saw troubles as well, as fewer customers than expected chose to upgrade to Apple's newest phones. Wednesday's cut to the sales forecast marked the first time Apple has revised its guidance to investors in more than 15 years. It appeared to confirm doubts about the firm's prospects that have troubled investors in recent months, contributing to the broader market sell-off. Production cuts by major suppliers had led to worries that the firm's newest phones were not gaining traction among buyers, in part due to high prices. "The question for investors will be the extent to which Apple's aggressive pricing has exacerbated this situation and what this means for the company's longer-term pricing power within its iPhone franchise," said James Cordwell, an analyst at Atlantic Equities. To sum up what Mr Cook told investors: some of this is under Apple's control, and some of it isn't. The economic realities in China - where growth is slowing - mean a region which Apple relied on heavily for new customers is no longer providing that boost. Coupled with a US-China trade war, this might get worse. There's little Mr Cook can do about that, save lobbying hard, as he has already, for exemptions that help protect Apple's business. But there's something else important at play here. The phenomenal smart phone era, a period that made Apple the world's richest company, is winding down. That isn't news. It's just happening more quickly than Apple had anticipated. Better, more reliable devices, with longer-lasting batteries, mean people aren't desperate to upgrade at the end of their contract. And ask yourself: what exactly was new about the latest iPhone model? Not a lot. Not enough. Will Apple's other products and services be enough to sustain its position? It has been trying to diversify what it does for some time with products like the Apple Watch and other online services, which have grown quickly but fall way short of the profit gained from the all-conquering iPhone. "As the climate of mounting uncertainty weighed on financial markets, the effects appeared to reach consumers as well, with traffic to our retail stores and our channel partners in China declining as the quarter progressed," Mr Cook wrote in the letter. He added that Apple was taking steps to make it easier for customers to trade in their phones and said other parts of the firm's business, including services, remained strong. "While it's disappointing to revise our guidance, our performance in many areas showed remarkable strength in spite of these challenges," he said.